VLCC, a pioneer in beauty and wellness industry, is organizing the ‘VLCC Ever Youthful’ campaign with the objective of celebrating youthfulness across cities in India in the month of June 2017. The campaign focuses on offering a combination of Body Sculpting, Skin Firming and Dermatological treatments with the objective of maximizing the benefit for the customers. VLCC’s combination packages are available at competitive prices, with savings in the range of 40-50% for the customers. The campaign will cover many states across India, including Delhi-NCR, Karnataka, West Bengal, Punjab, Rajasthan, Andhra Pradesh, Maharashtra, Tamil Nadu and Gujarat, in the month of June 2017. 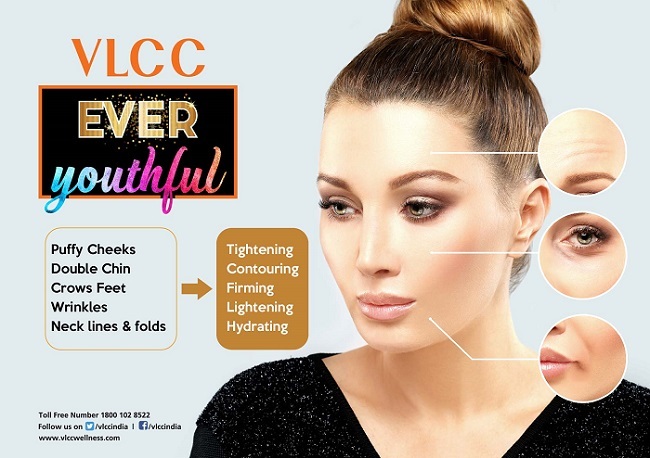 Under this campaign, VLCC will be offering a specially designed portfolio of services for tightening, contouring, firming, re-shaping, girth reduction, lightening of the skin, hydration for all parts of the body, especially face and neck, upper back, arms and tummy, thighs and legs.The services aim to address problems of puffy cheeks, double chin, crow’s feet, wrinkles, neck lines, and folds. There are 2 combinations available under this campaign. The first combination consists of 5 sessions of Slimsonic/ Rejuv and 2 sessions of Instant Wow Kit. This will cover Face and Neck and Upper Back region with Instant results. The second combination on offer consists of 5 sessions of Slimsonic/ Rejuv and 3 sessions of Instant Glow Kit. This can be done on the face, neck, upper back, arms, tummy, thighs, and legs.